National Community Investment Fund (NCIF) is a nonprofit private equity trust fund created in 1996 to capitalize and strengthen the mission-oriented banking sector. CDFI Banks and other mission-oriented banks provide financial products and services to businesses and individuals living in or serving low- and moderate-income communities around the country. NCIF was formed when Bank of America (then NationsBank) provided a long-term, low-cost loan of $15 million and entered into a fund advisory relationship with ShoreBank Corporation. Many other banks (MBNA America Bank, Washington Mutual, JP Morgan Chase), foundations (Ford Foundation, Annie E. Casey Foundation, Heron Foundation, W. K. Kellogg Foundation), regulators and the CDFI Fund have supported NCIF and its mission. NCIF is the largest investor in the mission-oriented banking industry, with investments in 12% of all certified CDFI Banks. NCIF has $205.6 million of assets under management, including $178 million in New Markets Tax Credit allocations. As an impact investor, NCIF pursues a triple bottom line strategy that maximizes social, environmental, and financial returns. National Community Investment Fund invests capital in institutions, primarily banks, that increase access to responsible financial products and services in underserved communities. NCIF contributes to their success by aggregating capital and knowledge and leveraging opportunities. NCIF generates reasonable financial, social, and environmental returns for its investors and funders. OUR VISION: National Community Investment Fund aspires to see a society where responsibly-priced financial products and services are available to underserved communities. NCIF also aspires to have investors value social and environmental returns in addition to financial returns. NCIF builds opportunities for CDFI Banks, Minority Depository Institutions, and other mission-oriented financial institutions through a variety of programs. We inform banks, investors, and others of the industry’s financial and social performance using our specially developed Social Performance Metrics and our forward-thinking industry research. We connect banks to one another to promote collaboration and innovation, and empower them to access regulators and investors. NCIF is a catalyst of industry innovation, encouraging banks to leverage new opportunities and innovative business models. 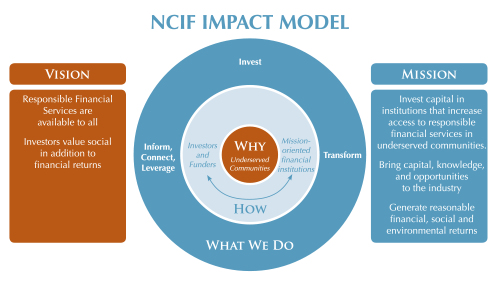 Through new business models and powerful social performance metrics, NCIF and its network aspire to transform the mission-oriented financial industry and the realities of underserved low-income communities.